With this specialty kit, you’ll be on your way to converting a fridge into a Guinness kegerator. There’s nothing quite like a pint of fresh, draught Guinness. Of course, dispensing the creamy Irish stout requires different hardware and gas than most other beers. This specialty conversion kit allows you to turn your fridge into a genuine Guinness keg. With this kit, you’ll get almost everything you need to start pouring delicious pints of Guinness on tap. That includes a European stout faucet, a nitrogen-to-CO2-tank adapter, a double-gauge nitrogen regulator, a 5 in. chrome-plated shank, faucet handle, as well as air and beer lines. The only thing you’ll need to add is a nitrogen tank that get filled with a special 75% Nitrogen/25% CO2 gas blend. Ask your local gas distributor about their specs for mixed gas, including: size (cubic footage), rating (i.e. 2015), and type of valve head used (CO2 or Nitrogen). You don’t need any special fridge to create your Guinness kegerator. As long as your keg will fit and there’s enough room for the conversion kit equipment, you’ll be good to go. You can mount the faucet on the fridge door for convenient pouring. If you have any questions about building your kegerator, feel free to as the experts at Kegworks. Great product..Every thing you need for having draft Guinness at home. The assembly could use some instructions. At least some gas pressure settings and general product descriptions such as pressure relief, on off position at the keg and just a little description on exactly how the system works. It was difficult finding the gas mix in a 20 cu ft. Bottle. There is a manufacturing flaw in the tap. The tap would not shut off without the removal a of an alignment pin in the assembly. Overall very happy so far.. This kit was a great deal. Got everything I needed (besides the tank) to start pouring Guinness. Installation was simple and self explanatory.Only Complaint: One of the gauge needles was stuck (the gauge for overall tank pressure was stuck behind the zero-stop, so it couldn't read more than "0" PSI). I had to drill a hole through the plastic gauge face to "unstick" the needle. I was not sure how else I could get to the needle. That is my only real and legitimate complaint. There may be an easier fix for this. I have my nitrogen/CO2 mix set to 35 PSI (static) and it reads about 32 PSI dynamic (while pouring), which is within spec. There don't appear to be any leaks in the system. The faucet works great and gives you the classic frothiness you would expect from Guinness on tap. Highly recommended if you're like me and the bottle or can just doesn't do it for you. I love the conversion kit, now I have Guinness on tap all the time!!! Absolutely love my conversion kit! I have my Guinness and my wife has her Flower Power. 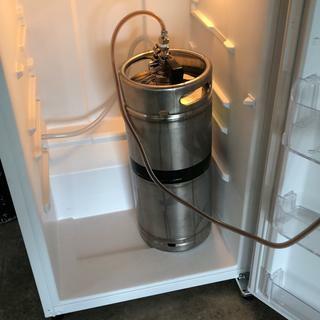 First kegerator conversion a success!! Easy install, cold Guinness all summer long. 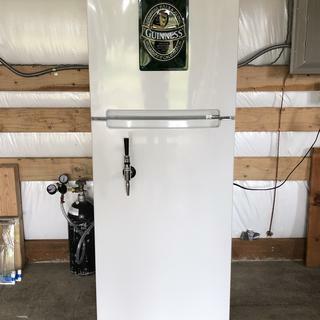 Congrats on your first kegerator build! Thanks for sharing your pictures. It looks great! Got everything done and hooked up. I think there is something up with the regulator. I can’t get it to stay at 35 psi. It always just maxes out no mater what I try. Thank you for your feedback. 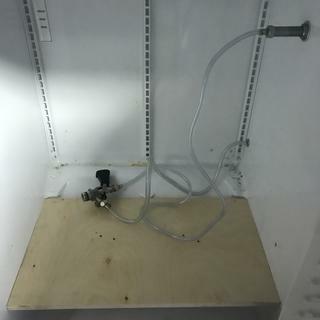 Your kegerator looks great, but I'm sorry to hear that the regulator is giving you trouble. Someone from our customer care team will reach out to you directly to help troubleshoot. If we find the regulator is faulty, we'll be happy to send you a replacement. Thank you for being a KegWorks customer. Cheers! want to convert existing system to Guinness. it better work! or i will be back to comment. My husband wants to build a Keezer for Guinness and asked for this for his Birthday. 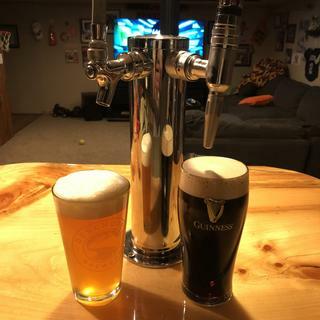 To put a Guinness draft beer system in my basement bar. We had some Guinness for a party but no one though about having the correct coupler or Keg assembly to serve it. Going over to the Guinness side. Anyone who drinks Guinness knows why! Does this set up work on co2 also? BEST ANSWER: Hi Stephan, with the included adapter you could hook up this system to a CO2 tank and use everything but the stout faucet. If you try to use a stout faucet with straight CO2 and not a beer gas mix, all you will get is foam. I would think it would. However you might have to change the spigot for something other than Guinness..
Hi. I purchased the Guinness system and you can not use it with plain Co2. You would need to find a source that can blend 25% Co2 and 75% Nitrogen in a single Cylinder. You also need to play with the pressure settings a bit though. How far does the stout faucet stick out from the fridge door? Maybe 2-3 inches at most. 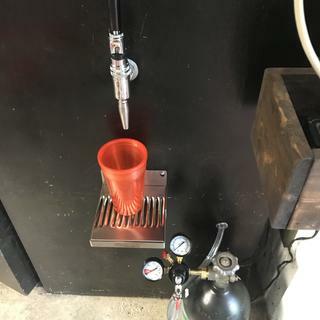 When youuse the conversion kit with your regular kegerator is there a special hose you need to connect the nitro tank to the keg ? BEST ANSWER: Sorry to hear about the trouble! It sounds like you have a leak somewhere. To find the source of the leak fill a spray bottle with warm water and a couple of ounces of dish soap. Spray it over all the connections. Where you see bubbles, you will find your leak. Most likely, it is in the connection between the regulator and CO2 tank. You may just need to tighten a connection or it may be a lost washer or damaged star seal. Once you find the source of the leak, contact our customer care team directly at 877-636-3673 or email customercare@kegworks.com and they will help you get the part you need! can i change for a sanke d coupler? BEST ANSWER: Thank you for your question. Our conversion kits are only sold as you see configured on the site. Unfortunately, we cannot swap components. Thanks for shopping KegWorks! Would this faucet accommodate a conversion for an actual Guinness tap handle? The handles I see seem to have a threaded bolt sticking out from the bottom of them. BEST ANSWER: Bryan, I'm hoping that I understand your question correctly. I bought this conversion kit, as well as an actual Guinness tap handle and it is compatible. The most difficult element is finding a company that will sell you the mixed gas in a 5lb bottle so that it'll fit inside your kegolator and be same temp as the beer. Other issue is finding anything smaller than a half keg - that could be a regional issue, but they don't sell pony kegs (1/6).